where a girl is tragically murdered by a devilish man again and again. throughout the game you will get no ryona animations. Mash the attack button to perform combination attacks. As you go on stages you will see different combination attacks. The bar in the upper side of the screen represents the enemy’s health. Konomi Nakahara (heroine) does not have a health bar. 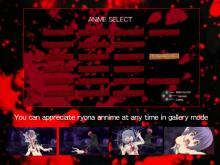 When Konomi is damaged a ryona animation is to be displayed. Since it takes place in her nightmare, death doesn’t mean the end of ryona. There are three stages (LEVEL). Brutality escalates with each stage. When you beat the enemy, you can choose either to go to the next or to end the game.